This outdoor digital billboard created for British Airways by Ogilvy 12th Floor is certainly an inspired example of real-time advertising. 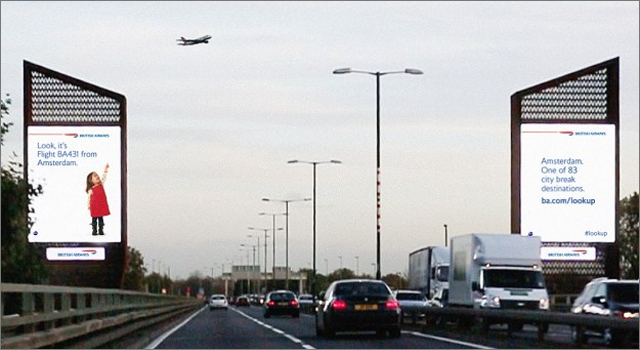 The digital billboards — part of the airline’s ‘Magic of Flying’ campaign — are located in Chiswick and Piccadilly and interact with British Airways aircraft flying overhead. The billboards use custom-built surveillance technology, that track the plane flying overhead, interrupting the normal rotation of the billboard with an image of a child pointing at the plane as it passes over. The billboard displays the flight number and the destination it’s arriving from, along with information such as the lowest available fare or the temperature at that location. Earlier this year Dutch airline KLM introduced a ‘Meet & Seat‘ program. Passengers who connected their Linkedin or Facebook to their booking could see the profiles of other passengers who had also chose to share their profiles. Connections could be made to get together prior, during or after the flight… and it was widely panned as being ‘really’ creepy. Meet & Seat is still around, and KLM is promoting the program with ‘Ne My Guest’, a contest where you can not only win a great trip to a cool destination, but you can also choose a well-known Dutch celebrity to sit beside you on the flight. You (and a friend, I assume they have to sit somewhere else on the plane) can join footballer Ruud Gullit on a trip to London to watch a Chelsea game; party backstage with DJ Armin van Buuren (somewhere) in the US, fly with supermodel Yfke Sturm to Couture Fashion Week in New York, attend the La Biennale Film Festival in Venice with actor and director Jeroen Krabbe, designer Hella Jongerius at the Oranjebaum Exhibition in Berlin, or finally join the first Dutch astronaut Wubbo Ockels (best name ever) for a space flight training mission. KLM is on a winning streak of very creative initiatives over the past year including a day when they gathered together 140 employees to tweet replies, added 4000 of their Facebook fans photos to a plane and hosting a dance party on a plane at 35,000 feet to promote a new Amsterdam-Miami route. Most of the time when a company releases a mobile app it’s to provide an important utility to their customers (or it should be). Scandinavian Airlines have gone the other way and have launched ‘The Time Killer’ app for people who are ‘not’ flying Europe’s most punctual airline. The app provides activities for customers of the other airlines as they kill time waiting for their delayed flights. Each game tracks your scores as you go, saving it in the high scores section. It’s all fun and pointless and that’s just the point. If you would have booked with Scandinavian Airlines you would already be in the air enjoying an an adult beverage and not sitting back in the departure lounge ‘spinning the hamster’ (yes, I just typed that). Unfortunately when it comes to booking an SAS flight through the app the experience breaks down a bit. The link takes the user to the SAS home page where the unfun begins. First: it’s not a mobile site. Why in the world would you not create a mobile app and not take the user to a mobile-friendly site to book a flight? Second: Why do you need me to identify which country I am accessing the site. 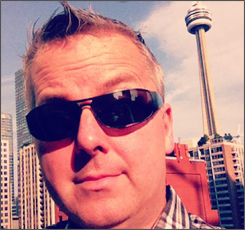 Why not ask me to share my location back in the app and append that information to the site URL? Even if I don’t share my location, at least give me a better way to identify my country of origin on your site. Redirect me to a mobile friendly landing page where I can select my country from a drop down. Or, detect my country and ask me to confirm. Arghhhhhh! The site is fun for a few minutes, shows that Scandinavian Airlines has a sense of humour and does do a good job at illustrating the key message about it being a punctual airline. 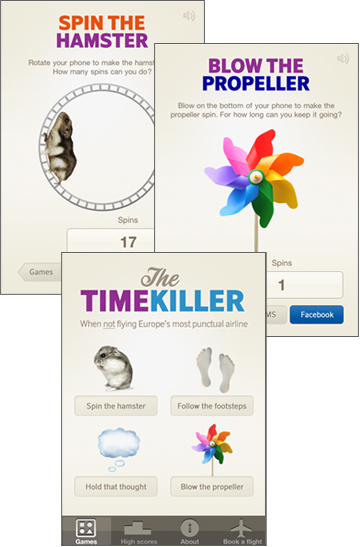 ‘The Time Killer’ app can be downloaded for free in the iPhone App Store. It’s the traditional fall TV premiere season and the networks are pulling out all the stops to promote their new crop of shows. Audiences are by no means guaranteed anymore as the TV viewing public is faced with hundreds of options in each time slot, as well as other activities such as video games, internet content and especially social media to distract their eyeballs. TV shows hoping to connect with an audience in 2011 must look to social media to not only promote, but to provide a second and third screen experience on laptops, mobile phones and tablets. In January, 2011 Neilson and Yahoo revealed survey results (to little surprise) that indicated that 86% of mobile phone users use the internet on their device while watching TV. Of those people, 33% were using mobile apps, 37% were browsing the internet and 40% were interacting with their friends on social networks like Twitter and Facebook. Sunday marks the premiere of ABC’s highly-anticipated and heavily marketed show Pan Am (I even received a physical postcard in the mail, the ‘real’ mail!). The show is based on the experiences of Nancy Hult Ganis who worked as a Pan Am stewardess for the airline from 1968 to 1975. However, the show will first go back to the year 1963, touching upon the music and style of that time, as well as the significant political and cultural events. The ‘My Flight Crew‘ application on the show’s Facebook page allows fans to create their own Pan-Am ID (despite my best efforts, mine looks super-creepy), choose a destination and assemble a flight crew including their friends to unlock exclusive content. My favorite part of the show’s social media effort is the Pandora Pan-Am Station, featuring selections of great pop, soul and jazz music from the 60s including Tony Bennett, Ricky Nelson, James Brown and of course the iconic Frank Sinatra. It’s been playing all morning and I haven’t hit the skip arrow on any of the tracks. 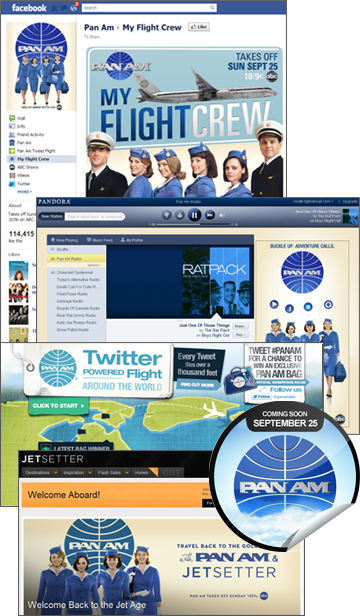 Fans of the show can enter to win an exclusive Pan-Am travel bag by sending a tweet with the #PanAm hashtag on the Pan Am Tweet Flight site. Each tweet advances the airplane 1000 feet towards its stop on a trip around the world, awarding prizes at random intervals. Each week sees the flight heading off to a different destination from a short London to Paris jaunt to a long haul to Hong Kong. 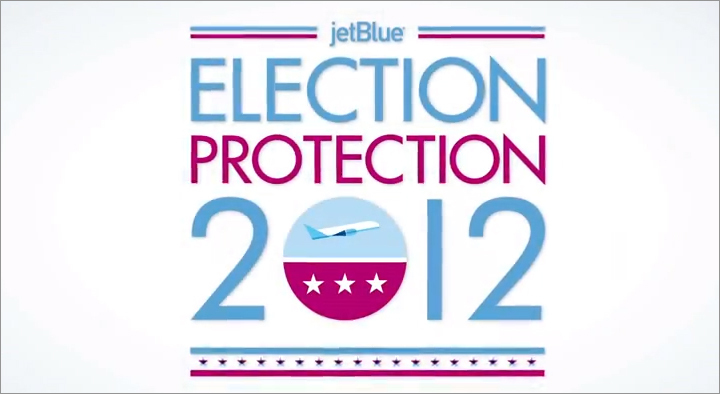 Earn exclusive stickers on GetGlue by checking in to the show. It seems odd to let users ‘check-in’ to the show before it airs, but over 55,000 GetGlue users have done just that. FYI, yes GetGlue does send you actual stickers if you want – when you have unlocked 20 stickers you can make a request to have physical stickers mailed to you. If you’re feeling the itch to travel the one of the exotic locations featured on the show, starting Sunday at 11pm EST travel site Jetsetter.com will begin to offer weekly deals based on the episode. If all this Pan-Am content makes you want to take on a stylish retro look when you travel, check out US retailer Brookstone’s stylish bags and accessories. It’s good to see the efforts that ABC is putting into social media to promote the show. The Pan Am brand has a nostalgic appeal to a 1960s lifestyle and style that has already been proven successful to shows like Mad Men.